Robinson Crusoe was my Classics Club spin choice way back in February and I was due to read it by 2nd April, which just goes to show how far behind I am in the reviewing stakes! I actually listened to it comfortably by the time I was “supposed” to but by that point I was deep in new job territory and didn’t get chance to revel in the success. Let’s revel now…. Surprisingly, these thoughts aren’t going to be a bit scrappy because I’m talking about something that I read back in March but because, although I didn’t completely hate Robinson Crusoe and found a lot in it to exercise the old grey matter, I didn’t love it either. If somebody told me they were going to read it, I wouldn’t be inclined to wrestle it from their grasp and hurl it far away but I also wouldn’t be begging them to get started and talk to me about it. I’m a little ambivalent about the whole experience, I think. As with so many classics that have spawned great numbers of adaptations, it turns out that I knew very little about the actual plot of this particular novel. Had I been inclined to pretend that I’d read it on the basis of the few versions that I’ve seen, I would have looked a plonker. I had no idea about the circumstances in which Mr Crusoe originally wound up marooned on a desert island (although I’d given it little thought beyond assuming some kind of shipwreck) and I definitely had no idea how long he was so marooned (we’re talking multiple decades, not months or years). 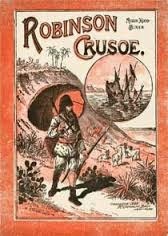 One way or another, I’d got the impression that Robinson Crusoe was more of an adventure type novel than it actually is. 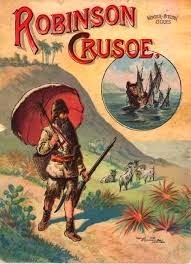 After an initial flurry of activity (that included a whistle stop tour of Crusoe’s slightly chequered past and, surprise surprise, a shipwreck), Crusoe is stranded on a pretty small island with little to occupy him but a Bible and the local wildlife for a considerable time period. The writing isn’t verbose or complicated and there aren’t great rambling sentences spanning pages but there’s still something that is a little bit draining about the narrative – it felt quite repetitive (although I know that in part that might be intentional and could easily be the best way of demonstrating the monotony of living alone with nothing but goats and cats for company…Crusoe loves a list. Be prepared for lengthy explanations of a day’s activities when the upshot is: went for a walk, built a fence. There’s also a good chunk where Crusoe narrates a few months of his early life on the island and then seems to remember that he’d had a journal for part of the time and then proceeds to “read” out from the journal. It’s sufficiently similar that I got in the car to drive home and was utterly convinced that I’d managed to skip back a part. It happens a couple of times and although there is a little bit more information in the journal entries, it isn’t really enough to warrant the repetition. On the brighter side, Defoe uses his island to make some good points about society in a way not dissimilar to Lord of the Flies (although definitely less engagingly) that stop things becoming too dreary. Crusoe seems to have an innate desire to overwhelm and dominate and never seems to question that he (as a white, apparently educated man) is superior to the indigenous people, even going so far as to rescue someone from being killed and devoured by the local cannibals (because obviously they must be cannibals) almost exclusively to satisfy his burning desire for a servant. Given that he was at the time inhabiting a shack of his own making and had little to do with his time beyond maintaining that shack and existing, I assumed that the only real need for a servant was to secure himself as above someone rather than for assistance with general household chores…it doesn’t paint the English mentality at the time in the greatest light. And not only is Crusoe enslaving and generally demonstrating why colonialism wasn’t necessarily the best, the way he communicates with Friday is infuriating and I did a lot of ranting in the car while he was insisting that Friday learnt English and and such like (rather than turning his own mind to learning the local language) and mocking Friday’s use of the language when it was anything less than perfect English. It seems to me from a browse of the reviews of this book on Goodreads that a lot of the hatred of the book seems to stem from this unfortunately prevalent racism. Although my 21st century sensibilities do balk at slavery and the abhorrent way that Crusoe speaks of other races, it doesn’t make me hate the book. Robinson Crusoe was originally published in 1719 and was immensely popular. According to Wikipedia (font of all knowledge that it is), it was in its fourth edition by the end of its first year of release. Clearly what Defoe was writing about struck a chord with 18th century readers and that makes it a fascinating piece of history itself. One of the reasons I read classics is that there’s an insight into the ideas and attitudes that were prevalent at the time and it would be churlish of me to mark a book down for fulfilling that brief a little too well. Crusoe also has a bit of a penchant for killing things for no real reason so if you’re particularly sensitive when it comes to animals, you might want to think twice. It isn’t graphic by any means but there is none of the relatively delicate modern approach to animal welfare, particularly where animals that we now see as domestic pets are concerned. It’s another thing that I was fine with marking down to being a sign of Crusoe’s times (or at least part of his character) but I can appreciate that it might be something that would put other readers off. Readers might not (I hope!) sympathise with what Defoe is articulating through Robinson Crusoe now but they were prominent ideas of the time and ignoring them, refusing to read about them or shouting about how disgusting it all was doesn’t change that. I obviously don’t agree with the vast majority of Crusoe’s social commentary or musings but that didn’t hamper my enjoyment of the book. Actually, it probably enhanced it because it is at least historically interesting as opposed to the intricate details of the planning, execution and revelling in the completion of the construction of a wall out of materials that you are (I am led to believe) likely to find on a desert island, which is somewhat less intriguing. Overall: I’d expected to either love or hate Robinson Crusoe but instead I find myself sort of in the middle. There’s plenty to mull over while you’re reading and as far as classics go, it says a lot about the time it was written in and the audience it was written for but there’s also plenty of drudgery that the book could do without. I think on balance I do recommend it but cautiously (with health warnings about the treatment of animals and slavery) and only if you’re in a ponderous mood.